Preheat oven to 160°C (325°F). Place the butter, chocolate, milk, sugar and vanilla in a large saucepan over medium heat and stir until melted and smooth. Pour into in a large bowl and refrigerate for 20 minutes or until cool. Add the eggs and whisk to combine. Add the flour, baking powder and cocoa and whisk until smooth. Pour the mixture into 2 lightly greased 22cm round cake tins lined with non-stick baking paper. Cook for 1 hour 25 minutes–1 hour 30 minutes or until the cake is cooked when tested with a skewer. Allow to cool in the tins for 10 minutes before turning out onto a wire rack to cool completely. To make the caramel popcorn, place the popcorn in a large heatproof bowl and set aside. Place the butter, honey and sugar in a large saucepan over low heat and cook for 6–8 minutes, stirring until the sugar has dissolved. Increase the heat to medium and bring to the boil. Cook for 1–2 minutes or until light golden brown. Working quickly, remove from heat, add the bicarbonate of soda and stir to combine. Pour the mixture over the popcorn and quickly stir to coat. Spoon the popcorn onto a large baking tray lined with non-stick baking paper and set aside to cool. To make the buttercream, place the butter, icing sugar and vanilla in the bowl of an electric mixer and beat for 8–10 minutes, scraping down the sides of the bowl, or until pale and creamy. To assemble the cake, trim the top of the cakes and discard. Halve each cake horizontally to make 4 even layers. Place the bottom layer on a cake stand or serving plate and, using a palette knife, spread with 1 cup of the buttercream. Repeat layering cake and buttercream, spreading the remaining buttercream over the sides and top of the cake. 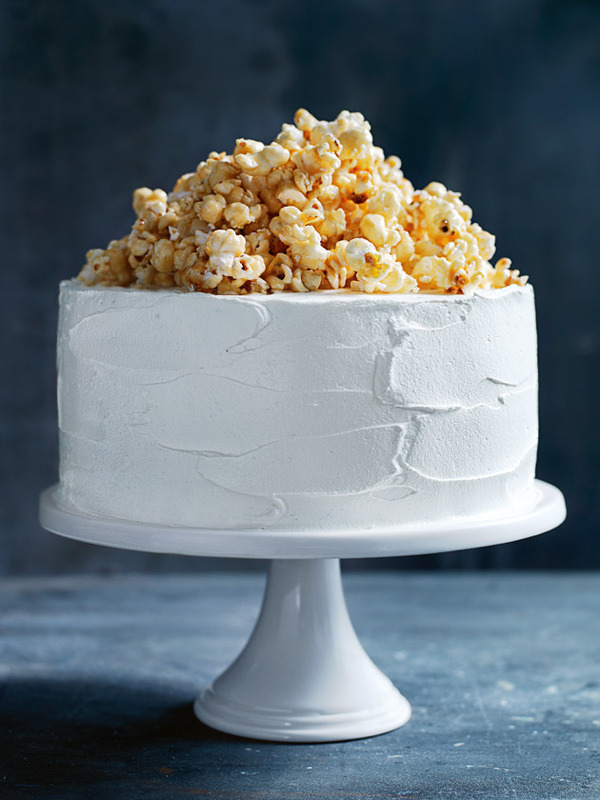 Top with the caramel popcorn to serve. Serves 12–16. Hi Virginia, we haven’t tested this so we can’t guarantee it will turn out the same. Let us know how you go! The DH Team. Hi Briony. Yes! This cake is perfect to bake a few days ahead. It’s best to keep it refrigerated and you can ice it on the morning of the celebration. We hope your son has a great birthday – The DH Team. Hello, I’m planning on making this cake this week. Just wondering about the use of the word “whisk”. Was an electric mixer used? I only have electric hand beaters, will these do the job? Thank you. Hi Belinda, it is possible, but make sure to line your cake tin with a 2 cm over hang incase the cake rises over the rim. Also check the cooking time, as it might vary. Happy cooking! I would LOVE to make this cake! Would it be possible to make it with two 20 cm cake tins instead of 22cm? How would I do this? If not, I have one 22cm cake tin, is it possible to bake the cakes one at a time? Thank you! Your icing looks really white! How do you achieve that? Is this the best buttercream recipe for a white icing? This was dauting initially but it came together beautifully and everyone kept taking pictures of it! Really yumms and the popcorn obviously finished first!